Flobot is designed to look after not only individual customers but account customers who may have multiple properties and multiple sites. Each one can be assigned a name and they are all very easy to find with Flobot's Google style search bar. With Flobot's flexible built in CRM, you can track you customer from enquiry to sale and finally payment - which of course, you can take directly into Flobot. Flobot also has a client portal module that allows you to keep those special customers in the loop. They can see all their appointments, engineer's notes, search for orders and even pay their invoices. See the new customer portal. 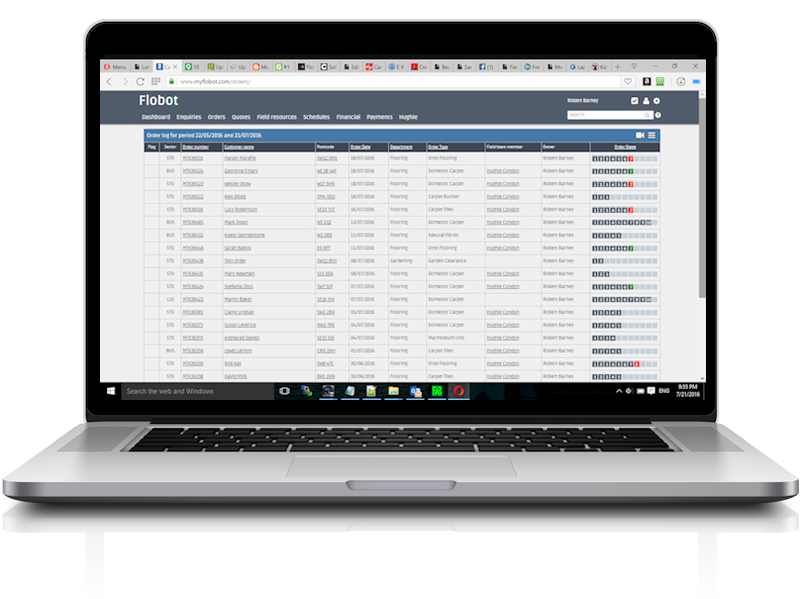 Whenever you create a new order for a customer, Flobot also creates a self-service account which they can access 24 hours a day from anywhere. Your client can see invoices and certificates and view live job updates, reducing calls into your office. Plus, now that you've captured their information you can send existing customers special offers and discounts - a very powerful marketing tool. Whenever your customer books another job, you can easily link it to their existing account allowing them to benefit from account discounts and promotional offers, which you can create quickly from your company settings section. All of your customers' history is immediately available, including customer type, account spend, notes, order history and lots more. It's a great feature which allows you to let your customer know how much you appreciate their business. Flobot lets you take credit and debit card payments straight from your customers, with all transactions being recorded and logged against the customer account - no chip and PIN machines to worry about and no forgetting who's paid what. Customers' card data can be securely stored against their account so you can quickly and easily take payment for future work. Flobot's secure 256 bit card data encryption and SSL connection means your customer's data is always kept safe. As soon as your customer's payment is processed a receipt and a customised 'thank you' email is issued. It's all about providing an end to end customer experience and provides you with another great marketing opportunity. Why not offer your customers an ongoing loyalty discount or promotional voucher? Flobot makes it really easy to do. Flobot lets you keep a record of every exchange with a customer - every email, every telephone conversation, every transaction and every appointment. You can even book in reminders to give customers a call and help you drive the sales process forward. Flobot enables you to maximise revenue from your existing database.